Everyone is familiar with the term “money pit”. Too many times a home remodel spirals out of control and money is spent without any idea of where it is really going. The homeowner’s vision can outgrow their check books. Seemingly small add-ons can blow the budget for any project. The home remodel budget template is a great way to focus the spending on what is really needed. This template eliminates spur of the moment decisions and maintains discipline throughout the project. Peace of mind is restored and the transformation can be enjoyed. 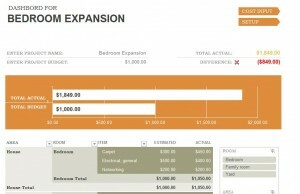 The home remodeling budget template is customizable for any home remodel project. This easy to use document reduces the stress of keeping up with the spending. This template is free to download and begin using immediately. The Microsoft Word Template is a fast way to generate an at-a-glance look at the entire project. Follow the four simple steps to a successful home remodel budget. First, save the free template to your computer. This template can be used again for another project. Second, enter the project name and budget in the necessary fields. Change the file name to track this specific project. Third, customize the project fields to accommodate the remodel needs. Fourth, enter the amounts budgeted for each item and the home remodeling budget template will calculate the project. Make each budget as thorough as possible. Do not leave anything out and there will be no surprises along the way. Create a unique budget for each project to track the spending from start to finish. Complete the home remodeling budget template with every expense. Monitor the budget diligently to find any unexpected costs requiring adjustments during the project. Refer to the data for future home remodels. Each remodel is different, but having a reference can be valuable guide. Home remodeling is an exciting adventure. Watching the transformation thrills every homeowner. Using the home remodel template from myexceltemplates.com allows the freedom to truly enjoy the process without the stress of the unknown.